The instrument is made up of a brass plate standing on four bun feet. Common hours are engraved on the plate in a circle, with a sun effigy at the top. 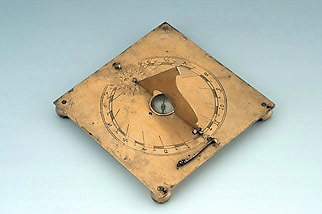 At the centre of the plate is a compass, and the gnomon can be folded when the dial is not in use. Under the plate is an inscription, no longer fully legible, reading 'A....NER No... 1590 faciebat'. Part of the instrument appears to be missing.